Havaianas flip flops have been around since 1962. 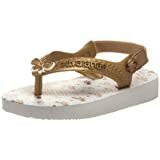 They were originally designed after the Japanese style flip flop with fabric straps and rice straw soles. Today they still have the signature textured rice pattern on the foot bed of the flip flop. They are the best rubber flip flops in the world. Their top secret rubber recipe makes them soft as marshmallows. They are showcased in fashion show runways all over the world. Unbelievable for a flip flop! Havaianas flip flops are the highest quality flip flops around. We discovered them at the beach five years ago. I purchased a pair for myself and my daughter. She has outgrown hers and we passed them down to my youngest daughter. Both pairs are still in great condition. I wear mine all summer while my youngest daughter wears hers all year long if she can get away with it. They are so comfortable and last for years. I can not say that about all flip flops. 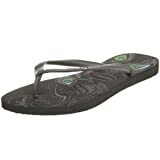 We have purchased many pairs of flip flops along the way and they have lasted maybe one season. The straps break most of the time or just get worn out. That does not happen with Havaianas flip flops. They are designed to last up to 10 years. My experience with Havaianas flip flops is that they run a little larger than your normal size. The adult sizes are S (5/6), M (7), L (8/9), XL (10/12). If you are between sizes then order ½ size down to get the right fit. Also note that any of the Slim line flip flops will not fit Wide Width feet very well. 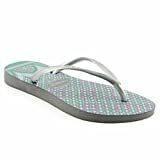 Havaianas flip flops come in a huge variety of colors and designs. Animal prints, peacock prints, and solid bright colors are all very popular by the pool or at the beach. 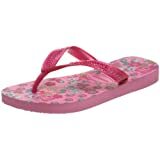 Their variety of toddler flip flops or sandals are also amazing for your child's little piggies. The colors and designs are great for little kids wear. They are fancy yet practical for every day wear. 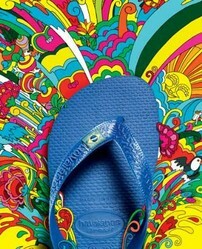 There are many copy cat designs out there but there is no mistaking the original Havaianas flip flop. Where Can You Get Your Havaianas Flip Flops? We purchased our flip flops while at the beach on vacation five years ago. I was not aware that I could purchase these flip flops online at Amazon.com. I have already purchased my entire family a pair as part of their Valentine's Day gift this year. My daughter's will especially be excited since this is a popular item to wear among friends. Don't miss out on hitting the beach, the pool, or the street in style this year with your Havaianas flip flops. SPB - thanks for commenting. Yes I am sure it is a little too cold in Chicago for flip flops during this time of year. I am not sure what to wear here in VA. One day it is 70 and the next it is 35. Hi clouda9 - yes they are cute. Comfie too. I know I would wear them all year too but my feet get so cold in the winter. Today is 70 degrees here in VA so I do have them on today! I am ready for spring and summer so I can wear them everyday again. Thanks so much for reading and commenting. Katie - my four year old daughter does wear hers all year. It is a fight to get her into normal shoes to cover her little piggies up. She will wear them rain or snow if I let her. Crazy. These are really very comfortable flip flops and last forever. Thanks for reading and commenting as always! 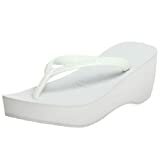 Cute, I love them, my two daughters would wear flip flops year round if I didn't hide them... lol great product review. Brenda - I looked to see if I could find any reference to Zorries but couldn't find anything. Who knows... there are so many fads that come and go. My daughter insisted on wearing hers to the grocery store the other day so I thought maybe I should write a page on these flip flops! She will wear them all year long if I let her. kinworm - it is a shame you can't wear them anymore than that. We are wearing our flip flops today here... It is 70 degrees! Unbelievable for Feb. They are so easy to pack too. Thank you for reading and commenting. Thank you Simple Stuffs - we love them too. They are so comfortable. I don't know if these are the same thing, but in the early 1960's these came on the market for the first time in the U.S., but they were called Zorries. They became the latest craze and could be purchased in grocery stores. Everybody owned a pair of Zorries.